We would all like to turn the clock back, and for more than just cosmetic reasons. There are those people in the world who have been exploring the technologies of yester year, and in the 189 years of photography there have been plenty of technological changes. And I include the digital evolution, but there were plenty of technological breakthroughs before that. Looking at a historical overview of the birth of photography and its progress, the initial plaudits went to France. Did you know that the French were the first to bring photography to the world? And no, it wasn’t somebody called Francois Kodak either (but more about that later)! 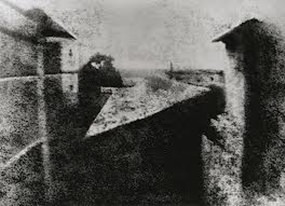 The first known “photographic” image was recorded in 1826 by a French gentleman called Nicephore Niepce. He managed to capture the view from his window, producing the image on a bitumen covered pewter plate. The exposure time for this epic making picture (or should that be “epoch” making?) was a record breaking eight hours! What took poor old Nicephore eight hours to produce, you can do in 1/125th of a second. Monsieur Nicephore then teamed up with another Frenchman, Louis Jacques Mande Daguerre (1759–1851) and the pair of them worked on trying to make “photography” a little bit easier. Nicephore expired in 1833, turning up at the pearly gates with his pewter plates under his arm, but Daguerre continued in his quest of the Holy Grail, or to photograph it, if nothing else, even though he was by then 73 years old. By 1839 when he was 80 years old, he had managed to produce images on highly polished silvered copper plates and released the details in August of that year, but only after obtaining a lifetime pension for himself from the French Government. Daguerre was no dunce! Neither was the French government, as it knew with Monsieur Daguerre being 80, the “lifetime” would not last too long! However, while the French were exposing themselves and their plates to the sun, an Englishman by the name of William Henry Fox Talbot (1800–1877) was experimenting exposing silver impregnated paper and produced the first “negative”. By then exposing his sensitized paper to the negative he had made previously, he managed to produce positive copies. Now, more than one image could be made from the one photographic session. Think about it, this was ground-breaking stuff. However, Fox Talbot did nothing about his new process until he heard from France about Louis Daguerre’s “invention”. In the same year (1839) he then rushed into print with details of his process. This was the start of modern photography. Exposure times were still an hour or so, but in 1840 the simple photographic lens was improved by Josef Petzval allowing 16 times more light into the camera and exposure times dropped to around 4 to 5 minutes. Portraiture had arrived! The impact of Petzval on photography is often forgotten, but his improvement to the optical lens had actually much more of an effect than the slow improvements in the sensitivity of the film plates of the day. For the next four decades photographers spent their time refining the “negative” process; however, it took an American to bring photography within the reach of the masses. His name was George Eastman (1854 – 1932) and he was an inventor and an industrialist. In 1888 he introduced the small box camera with a 100 exposure roll film inside, but he was unsure of what to call it. The marketing gurus (yes, they had them in those days) told Eastman that a good catchy name should have K’s in it. And so “Kodak” was born. Two K’s had to be better than one! From there it was really refinement of the silver halide processes and then color negatives, until the digital era came upon us, in which we stand right now. The next round of advances will certainly not take 189 years, I can assure you. Cameras that work as phones will be refined and “connected”. The brave new world is here.